*** #1 Education App Developer for iPad – Over 1 million teachers are using Splashtop Remote Desktop, Whiteboard & Classroom products to improve the teaching and learning experience Splashtop Classroom: Control, Annotate, then Share a teacher’s PC/Mac with a students iPad or Chromebook, or PC/MAC running a Chrome browser. 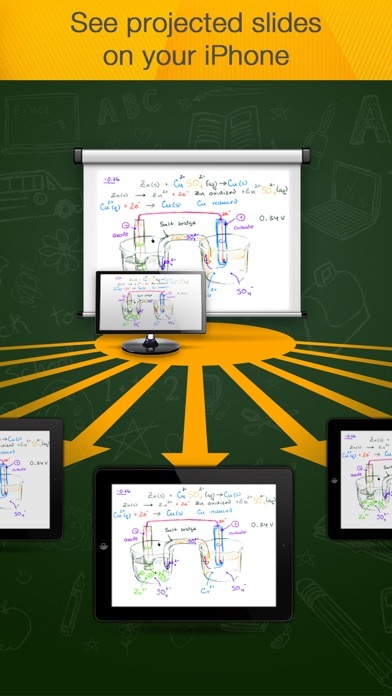 Splashtop Classroom allows teachers to stream their PC/Mac screen together with audio to every student’s iPad, Chromebook, PC or Mac, improving student engagement and interactivity. 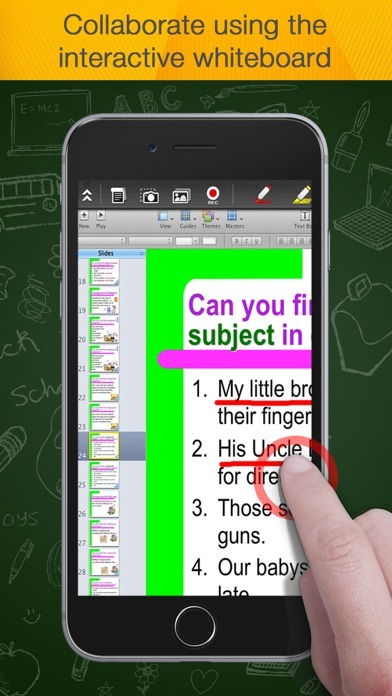 Students can then view, control and annotate over lesson content directly from their mobile device. 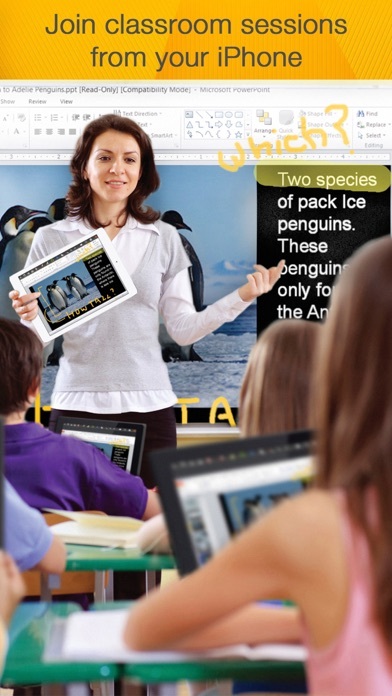 Splashtop Classroom is perfect for teachers and instructors that want to engage and motivate their students. Pass control to a group of students and let them explore and communicate their ideas with the rest of the class without moving from their seats. Even the most demanding multi-media applications can be shared instantly and with a great user experience. 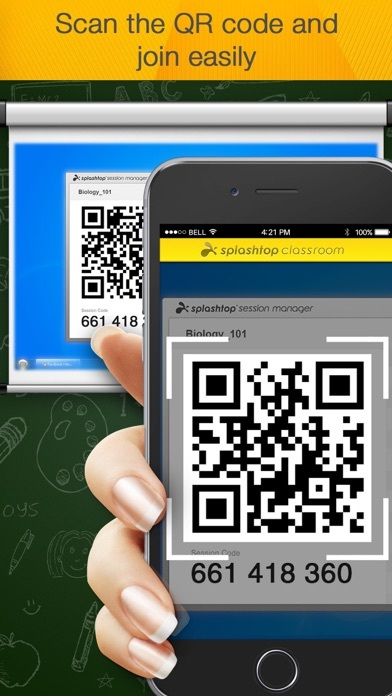 Splashtop Classroom is perfect for 1:1 and BYOD initiatives! TEACHERS CAN: + Teach from anywhere inside the classroom. Have complete control over applications such as Keynote or PowerPoint or Flash-capable browser on the classroom PC as if you were sitting right there. No need to stay at the front of the class. Be free to roam around without losing control of the class! + Annotate over any content. Use gestures to draw, highlight, or write over any content. Take snapshots of the screen and save them to the gallery then print or email the snapshots to students, parents or colleagues. Use different colored and sized pens, stamps, highlighter, shapes, lines, and text tools over existing content or Flipchart backgrounds. Use the spotlight and screen shade tools to keep students focused. + Share anything from your computer instantly. Even the most demanding multi-media PC / MAC applications can be shared instantly from your iPad without any reformatting using unfamiliar authoring tools or uploading ahead of time! Have a website or YouTube FLASH video to share with the class? 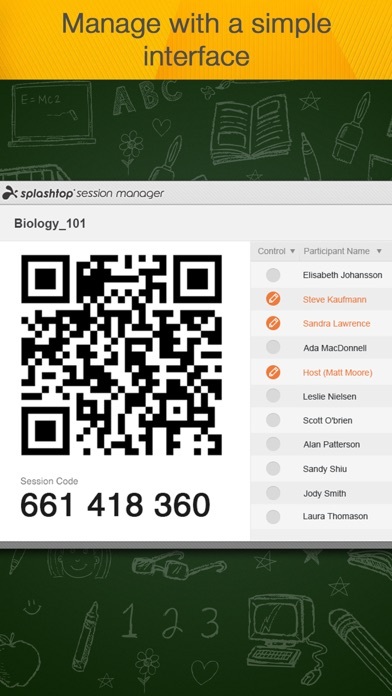 No problem – just start a Splashtop Classroom session and display the QR code for students to snap and instantly join! Visually or hearing impaired students can now see, hear – and interact with - the lesson content from anywhere in the class. + Capture student ideas easily. Pass control to a group of students and let them communicate their ideas with the rest of the class without moving from their seats. Annotate content or select an existing flipchart background and share it with the rest of the class. Take student engagement to the next level while improving classroom management! ***** Read how our education users love using Splashtop! ***** "The Splashtop Classroom software not only increases my instructional effectiveness, in that it allows me to roam the room as I teach, but it also increases student engagement, eases my workload, and makes my workday even more enjoyable. Effectiveness, Efficiency, Engagement, Ease, and Enjoyment- Splashtop is a 'multiple win situation.' It has become an indispensable and integral part of my everyday professional routine. I will never be tethered to a computer again!" Kevin Nerz, Ed.D. High School teacher "Splashtop Classroom allows our teachers to increase student engagement with or without a projector - also allowing students to take control and present their ideas from their own device. Splashtop also has the added benefit of allowing teachers and administrators to access their files and information from anywhere without having to return to the office and be chained to their desk." Darrin Tingey, Technology Director, Fremont Re-2 School District Please visit https://education.splashtop.com for more details. I can’t log in to my splashtop account. Use in 1:1 IPad environment. Splash top gives me freedom to control everything on my teacher PC from and IPad, have students collaborate about their understanding. We can also let any IPad take control to type, photograph or mark up any products on teacher PC in real time. Thank you, Splashtop!! I'm a math teacher for middle school and I absolutely love this app. I hate being stuck at the front of the room and with this app, I use my iPad and am able to teach from anywhere in the classroom. In conjunction with my smart board software I can also record my lessons with this app and post them online for my students to view. This especially helps when they are absent or can't remember the lesson. This app also allows my students to write on my iPad and have their work show up on the board...they love it! I've already got other teachers hooked on it! You can't even log in. I was very disappointed. This app is not what you were most likely looking for. I started using this app in my classroom yesterday and it is the most useful app I have ever downloaded! I am so excited about putting its many features to use in my high school mathematics classes. You will not be disappointed! Love this! Great for classrooms with various devices...I use it with Smartboards, Macs, and iPads and want to set it up with our Promethean and PC products as well!